Whether you are looking for a fun family vacation or a romantic getaway; this cozy renovated water front cottage has it all. Situated on a 23 acre pond surrounded by a lovely wood setting ,enjoy sitting on a private beach with fishing, swimming, and boating with all the conveniences of home such as WIFI and a flat screen television. Enjoy cooler nights with a beautiful new gas fire place. The cottage has two bedrooms, one with a queen size bed and picture perfect view of the pond. The other bedroom with two twin beds. A futon is also available. There are pillows and extra blankets if you would like to use ours, other than that please bring your own bed and bath linens. The kitchen is well equipped for your dining pleasure whether you are grilling outside or dining in. Close to beautiful bay and ocean beaches, take in the beauty of the sea by day, and the stunning sunsets at night. Just down the street from the National Seashore Visitor Center, enjoy biking, hiking, fine dining, shopping, and the best of Cape Cod! We are the Bennett Family From Saratoga NY. Bill, Debbie, Jessica, and Rachel have been vacationing in Cape Cod for 24 years. We have stayed all over the Cape and by far, Eastham is our favorite. We love the National Seashore, and the nature and beauty of Eastham. After years of vacationing, we knew this is where we permanently wanted to vacation; so the cottage on beautiful Minister's Pond was purchased. This property is unique for it is nestled in the woods on a beautiful pond and you feel so relaxed like you are far away from everything but in actuality, everything is all around you. We love the feel of the cottage which reminds you of old Cape Cod, with a rustic knotty pine kitchen, lake front, and fire place. The ultimate in relaxation. We love the view from the back porch. In the morning the sun streams through the clouds and settles on the shimmering lake. We love the natural sounds of the pond and the beauty of nature that surrounds us. On chilly evenings the brick fire place provides a cozy atmosphere. We had an absolutely wonderful time here. The communication was great leading up to our stay and the cottage exceeded our expectations in many ways. It’s as cute as in the pictures and everything you need from dish soap to paper towels was provided. The bed was comfortable and the view of the water was just lovely. It got a bit buggy at night but they cleared up once it was totally dark. The pond is definitely swimmable, the water is warm! It was a great central location, we got a CCNS beach pass (highly reccomend) so it was easy to get to the various beaches from the cottage. The only thing I might caution is that the second bedroom and bathroom have sliding barn doors so they don’t totally close, there are large gaps on all sides so it’s not totally private/ sound proof from the living room. This didn’t bother us at all but might if you had more people staying there. It was the perfect size for the two of us and we will definitely stay here again, I highly recommend it. Thank you so much for your kind words. Bill and I put a lot of love into the little cottage so that we and all of our guests could enjoy. We want our guests to have the best Cape Cod Experience. The barn doors were put in for room factor and also because it had a trendy feel. We are so happy you had a great experience and look foward to seeing you in the future. This small but perfectly formed, well maintained cabin was the perfect place to spend a week relaxing on Cape Cod after a busy few days sightseeing in New York. It looks out directly over the pond with easy access to the small beach and dock. We loved swimming in the pond, with the kids loving using the row boats and jumping off the pontoon. We had everything we needed in the cabin including excellent wifi (essential when you have a teen and a pre teen! ), lots of cooking equipment, comfortable beds and good cool air options. Nauset Haven is close to all the amenities of Eastham as well as great Cape Cod Bay and Atlantic coast beaches and is about 30 mins from Provincetown. Dealing with the owners, Bill and Debbie, via the website from the UK was easy and gave me confidence that all would go well. Thanks to you both for letting us use your gem of a holiday home. Thank you so much for staying with us this season. We are so glad you enjoyed The Cape House and hope in your future travels you will visit us again. Great location, really nicely renovated. The house was in a nice location on the pond. Close to beaches, restaurants etc. Very convenient. Just a bit small for 2 teenage boys and 2 parents. 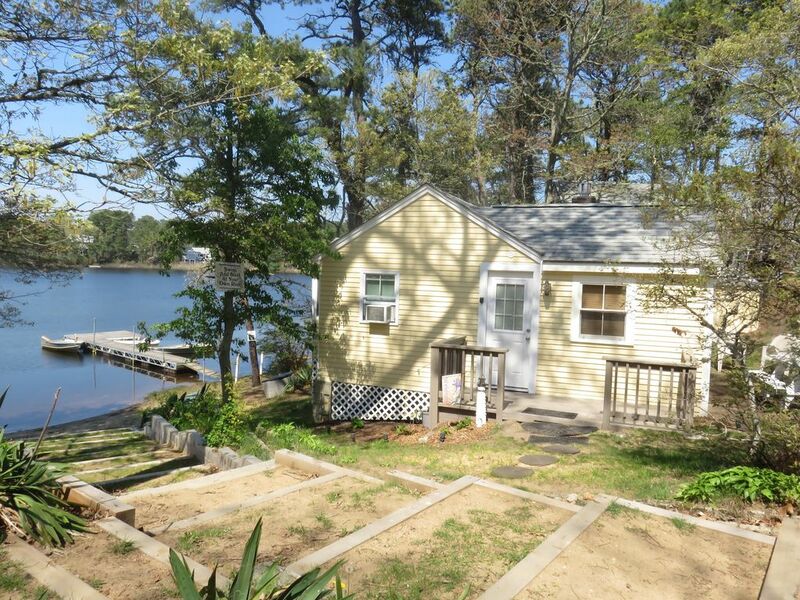 This updated, cozy, clean, waterfront cabin was perfect for our family! My husband and I stayed here with our 2 y/o son this summer and had a great time! The cabin was bright and clean and had every amenity we could want. We enjoyed lounging by the pond and taking the rowboats out and exploring the various beaches and restaurants of the cape. We've stayed in other cabins at Nauset Haven in the past and this was our favorite. We look forward to returning! Thank you so much for the kind words. We try to keep our cottege In the best possible condition and are very big on clean and affordable rent. We look foward to your return to the Cape. As always if you need anything you may call at any time. Oh my gosh! This was the perfect place for 4 women to enjoy lazy mornings and quiet evenings. My favorite 3 cousins and I spent a week on the Cape and used this lovely cabin as our "base Camp". The cabin is a perfect reflection of what is great about the Cape. Its casual enough to be so comfortable yet is up to date in the decor as well as super clean. It had all the supplies we needed. They even had lobster bibs, napkins and tools to have a lobster dinner (which we did- and laughed through the entire experience as we tried to dissect steamed losbsters). The location was within 10-15 minutes of beaches which is where we spent most of the afternoons. The evenings were quiet. In fact, I'm concerned that our laughing may have disturbed others as I never heard any noise from any other cabin while we were there. This was my first visit to the Cape and if/when I return I can say I don't need to look any further for a place to stay. This will be my go to property! Close to Skaket beach, a serene bay beach with wonderful sunsets, Nauset Light Beach with occasional seal watching, and beautiful Coast Guard Beach. Other activities include bike paths, nature and hiking trails, playground, horseshoes, children's rec center with books and games. Check out time is 10 a.m. Saturday, Please be prompt for cleaners. Check in time is 3 p.m. Saturday For long term rental, please contact owners for pricing.